Who would imagine that a film almost entirely about the political process (the passing, in 1865, of the 13th Amendment to abolish slavery in the United States) could be quite so gripping and dramatic? It is both of these things and more, though in fairness, it does take a while to get going. 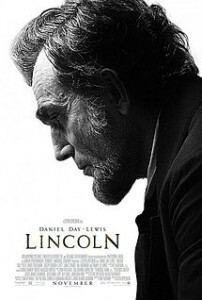 We owe this largely to the incomparable performance of Daniel Day-Lewis in the eponymous title role, but also to the excellent cast around him (notably Tommy Lee-Jones as the radical Abolitionist, Thaddeus Stevens, and a wonderful performance by Sally Field as Lincoln’s grief-stricken wife). And of course, there’s always Steven Spielberg’s superb direction! It is a dramatic story, set against the backdrop of the American Civil War. There is a microcosm of the larger conflict within the Lincoln family itself. Abraham is at odds with his eldest son Robert (Joseph Gordon-Levitt) who is desperate to quit Law School and join up and do his bit, totally against his parents’ wishes. Lincoln’s ‘favourite’ is the younger son, Tad, and there is much talk of a middle sibling who has died from illness – the reason for his wife’s grief and mental instability, and a source of great conflict between the parents, leading to some of the most dramatic scenes in the film. The central theme though is the moral and political dilemma around slavery. In 1860s America, this is definitely not a black and white issue (pun intended). Abolitionism is one thing, but enfranchising freed slaves? Something completely different. But the imperative, for Lincoln, is to get the Amendment through Congress, and the film deals largely with the skulduggery and politicking necessary to persuade (bribe?) various Democrat Congressmen to switch sides and vote for the Amendment, not to mention those Republican Congressmen who could not bring themselves to vote in favour either. There’s an excellent performance by Tommy Lee-Jones (when does he ever give a bad performance?) who perfectly embodies the thick-skinned, pragmatic, two-timing Congressman. The irony being that, despite this, he is one of the very few highly principled men in Congress and was a fervent abolitionist all his life (there is a nice twist on the day the Amendment is passed when he returns home from Congress). The film is atmospherically shot through a filter with a slight sepia tinge, and with much of the political wheeling-dealing done in darkened rooms and at night, thus enhancing the clandestine nature of Washington politics. Lincoln himself, whilst being portrayed in glowing (even hagiographic) terms, was certainly not above using dirty tricks to achieve his ends. There is, in fact, much humour surrounding three agents brought in as ‘fixers’ to secure, usually by offers of lucrative government posts, the votes needed. On the day of the vote itself, Lincoln is not averse to downright lying (he’s reminded that this is an impeachable offence, but there the similarity with Nixon definitely ends!) in order to carry the day, which, of course, he does. There is not, however, much of a Hollywood ending for as soon as the War is over and Lincoln appears to be at some kind of peace with his wife and himself, and full of plans to travel to the Holy Land he is, of course, assassinated. This film pulls off a remarkable feat. On the one hand, it glorifies one of America’s greatest presidents, still widely revered by the American people (though probably less so south of the Mason-Dixon Line! ), whilst at the same time, portraying him as incredibly human, strangely fragile and distinctly flawed. Lincoln appears to have been the consummate politician (the film is based partly on Doris Kearns Goodwin’s “Team of Rivals: The Political Genius of Abraham Lincoln”), but was undoubtedly a principled, fair-minded and popular (with exceptions) President. Some of the warmest scenes in the film are when Lincoln tells anecdotes (often funny) to the close coterie of men around him. It illustrates his folksy wisdom, but also his considerable intelligence and wit. “Lincoln” is an excellent piece of cinema that, I suspect, will have (particularly American) audiences blubbing in the aisles. This entry was posted in Blog and tagged Aliens & Others, American, Film club, Film review, Lincoln, Politics, President. Bookmark the permalink.